Get ready for a 50th birthday celebration. 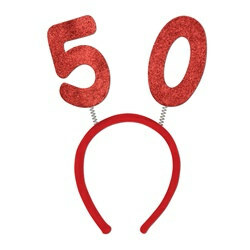 Make sure to pick up these 50th Glittered Boppers to show off that you are the birthday boy/girl! Wear these 50th Glittered Boppers for your own 50th birthday party or pick the 50th Glittered Boppers up for a friend or family member's birthday celebration. The soft fabric covered headband attached to the 50th Glittered Boppers makes them easy and comfortable to wear. I was happy with these and all my purchases!